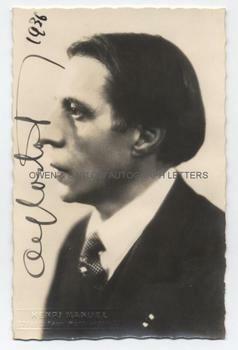 Photograph signed "Alfred Cortot, 1936". on deckle edged post-card. With blind stamp of the photographer Henri Manuel, Montmartre in lower right corner. Approx 5.5 x 3.5 inches (14 x 9 cms). 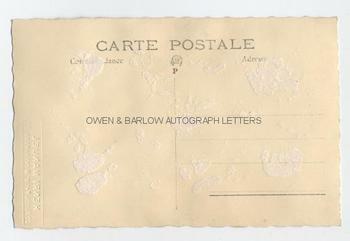 Slight silvering to edges and with mounting traces to verso. VG. Alfred Cortot was one of the most respected of 20th century musicians and was particularly renowned for his interpretations of piano works by the romantic era composers.